We’d love your help. Let us know what’s wrong with this preview of Twilight on Terra by Kevin Partner. Can Arla uncover this galactic secret before the machines conquer the galaxy? Or has she been sent on a fool's errand? Join her on another fast-paced trip across the galaxy as she grapples with universal mysteries and finds help where it was least expected. To ask other readers questions about Twilight on Terra, please sign up. We follow on with the story of Robot Empire, with this, the 5th book in the series. Arla Farmer, Captain of the generational Arkship Dawn, has trouble on her hands. She is faced with a difficult decision and her crew are fully behind her, with one exception, the priest Prime Xi. He has gone behind her back and made a deal with Admiral Minchin to take control of the ship and mutuny against her. The Admiral decides it is a good idea, in the first instance, to execute Captain Farmer and he sends his We follow on with the story of Robot Empire, with this, the 5th book in the series. Arla Farmer, Captain of the generational Arkship Dawn, has trouble on her hands. She is faced with a difficult decision and her crew are fully behind her, with one exception, the priest Prime Xi. He has gone behind her back and made a deal with Admiral Minchin to take control of the ship and mutuny against her. The Admiral decides it is a good idea, in the first instance, to execute Captain Farmer and he sends his men in to take control of the ship and execute Arla. Barely escaping with her life, Arla and her loyal crew members escape in the nick of time. Their small ship, Scout, just manages to escape the shutdown of the Dawns landing bay doors, squeezing through the tiny gap and out into space, safely away from the Vanis Commander. Scout makes its way towards Earth. Arla believes that another generational Arkship like the Dawn, named Zenith, was sent out of Earth for the same reason as the Dawn was. She wants to go back to Earth in order to try to track down the Zenith and hopefully join up with them, if possible. This is a brilliantly written absorbing story that has gripped me for the entire 5 books in the series. It's a fun read and has a great group of characters who really get under your skin when you read about them. I loved the diversity in this book; robots, humans and aliens all coming together to make a really interesting mix as the story nfolds. I loved this story because it was so full of hope for both humanity and the robots. I love the character called ACE, she is an uber villain of magnificent proportions. She is truly scary in her obsession with absolute unity of the robot empire. She was so very powerful. My heart went out to the small and nervous robot, Doxie, who is terrified of Ace. She is such a wonderful character. I loved both the good and the bad in this book in equal measure. They are all so well written and full of life. This is a great book of you are looking for a good, gripping taLe with lots of twists and turns in it. It has full on action and powerful emotion in the most unexpected places, after all, who would ever expect robots to have emotions? I certainly didn't. I look forward with anticipation for the next book in the series. If it's half as good as this one, it will be a great read! Captain Arla Farmer leaves first mate Xi in temporary command of her Arkship, Dawn [one of three such ships, with Zenith and the eponymous Twilight], while she travels on the AI ship Scout to rendezvous with ally Nareshkumar, who has brought the Vanis Fleet's Admiral Minchin and Minchin's aide-de-camp Vice Admiral Ibori, aboard the Scout with him at the start of this fascinating adventure by the inimitable Kevin Partner. What has become of the missing Zenith arkship? Who gives Arla news of its whereabouts? What is the new weaponry possessed by the Zenites? Where do Arla and her companions meet Wells? As Dawn is in peril, where will Xi and Bex, (the female-embodied AI) take the colonists? Who betrays Arla and seizes control of Dawn? What do those aboard Scout find in Portsmouth UK? As one side and then another starts a power play, can Arla and her loyal Team take on and overcome the deadliest threat to Earth [and its remaining survivors], they will ever face? "Humanity has been found wanting." 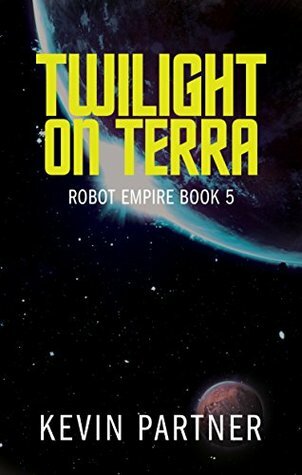 Continuing the unusual story of homesteading, religion, space exploration, antagonistic robots and curious replaying of history, Twilight on Terra is perhaps the most accessible of the Robot Empire series so far. Although not absolutely "Humanity has been found wanting." Continuing the unusual story of homesteading, religion, space exploration, antagonistic robots and curious replaying of history, Twilight on Terra is perhaps the most accessible of the Robot Empire series so far. Although not absolutely essential to have read the preceding books, it is highly recommended: the series has layers of complexity which would make this story very hard to comprehend without the background information. This is easily my favourite book in this series so far. Many questions are answered, while many mysteries are left unsolved. Plotlines and characters from the first few books are seamlessly brought together to form an intricate and novel overall picture. As usual, the writing is brilliant. I cannot wait for the last book!